Posted at 3:37 pm on September 28, 2012 by Lori Z. What video? 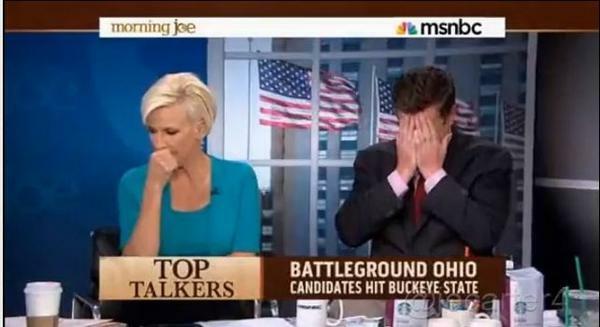 Oh, just one that Joe Scarborough ran on MSNBC’s “Morning Joe” and other media outlets breathlessly ran with it. Turns out, he should be double facepalming himself. That’s right. MSNBC ran a clip that tried to paint a false narrative. They claimed that a crowd at a rally was chanting the name Ryan. And that Mitt Romney jumped in and tried to get them to chant Romney instead. What really happened? The Blaze uncovered the deception. Indeed, the MSNBC closed captions claims the was crowd chanting “Ryan!“ when attendees say they were actually chanting ”Romney!” Obviously, this changes a lot about the situation. Instead of awkwardly inserting his name into what sounds like a failed chant, Gov. Romney was actually including his running mate in a crowd chant of his own name. And, as we discovered, live tweets from a couple of journalists covering the rally prove it as well. Romney gets on stage and the crowd chanting 'Romney, Romney' and so Romney starts a "Romney/Ryan, Romney/Ryan" chant. Romney asks crowd to switch "Romney" chant to "Romney-Ryan"
RT @GingerGibson: Romney gets on stage and the crowd chanting 'Romney, Romney' and so Romney starts a "Romney/Ryan, Romney/Ryan" chant. Journalists for Obama aren’t just shamelessly cheerleading now. They are trying to fix the game. Twitter users are disgusted, and rightfully so. @joeNBC – You laughed at the Ohio video of Romney trying to get the crowd to chant Romney-Ryan as if they were chanting Ryan. U r so sad. @JoeNBC Hey Joe nice edit job on the Romney/Ryan video (you hack) – are you a wiling collaborator for the liberals or just a dupe? Sweet Jesus @JoeNBC you are an embarrassment! Responding to a doctored MSNBC video that way! Mitt asked them to ADD Ryan to their chant. @adamsbaldwin @StrokesofCandor @JoeNBC MSNBC doctoring video clips, I'm shocked. It's almost like they don't like Republicans. @JoeNBC Ohio "Ryan" chant was dr. See same CNN video for proof. Do you have the guts to correct on air? Or does Mika have you wrapped?? Some are still falling for the deception. Perez Hilton just posted and tweeted about it this afternoon, even after the video was proven to be false. You know what else is a far cry from great? Lying liar who lies, Joe Scarborough. He doesn't. RT @indyrallen @lessat @adamsbaldwin Yes. We will see if @joenbc has any integrity. These lapdogs need exposed every time. Enough. The Fourth Estate is completely insolvent. Time to pack it in, lapdogs. Update: Aww, call the waahmbulance! The fake controversy over the Ryan chants is a joke. Romney said "What a guy!" The crowd chanted "Ryan!" and then Mitt jokes "Romney/Ryan!" Really? That’s all you can come up with? You double face palmed. Why would you do that if that is what you referring to originally? What on earth would be face palm-y about that? Why would you say “sweet Jesus” for that? You can’t even lie well, dude. He continues stomping his little feet. I won't even dignify the site that is fanning this false controversy but I will take note of those who link to the lie. Oh noes! He’s taking note! We are quaking in our super cute shoes. Of course, it’s quaking from giggle-snorts, but still. Expect to hear the tape again on Monday. I'm going to have the tape linked this weekend. You watch and be the judge. We will also play the CSPAN tape on Monday. Going to be fun. Why? Will you be “editing” some more?